Three design pillars in Art Deco style. 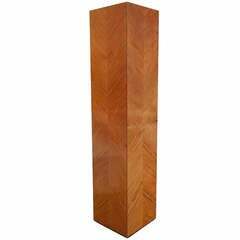 Feature a beautiful Macassar veneer on the top and bottom plate as well as high gloss piano lacquer finish on the body. Single measurements in cm: Large: 38 x 38 x 107 (LWH) Small: 38 x 38 x 75 (LWH) Slim: 28 x 28 x 107 (LWH). Pair of French Art Deco white plaster pilasters with palm tree design in the manner of Serge Roche. 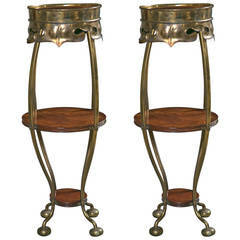 (Note: Could me made into up-light floor lamps). 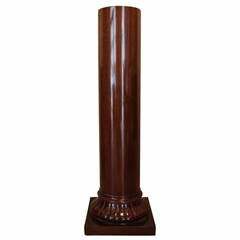 Beautiful carved Art Deco pillar made of mahogany, simplistic decoration at base with deep French polish. 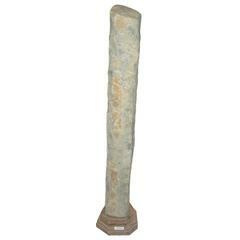 A 16th century stone pillar from Shanxi, China. 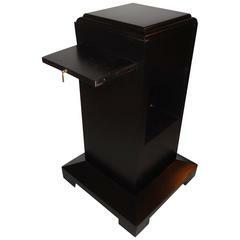 Mounted on a seven-sided wood base. Striking. Perfect for a great sculpture.